Oh guys, I am so flippin' excited to share this with y'all - please meet Orion! Eeeek, I love it so much!! 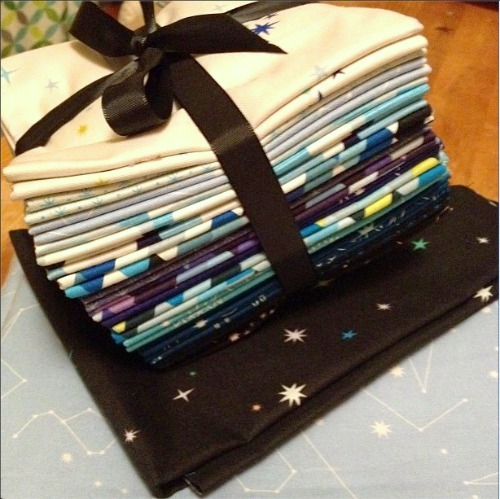 I was lucky enough to receive some of Lizzy House's new line Constellations from Andover Fabrics (check out their Facebook page and give'em a thumbs up if you like what you see) and this pattern was totally inspired by the fabric. 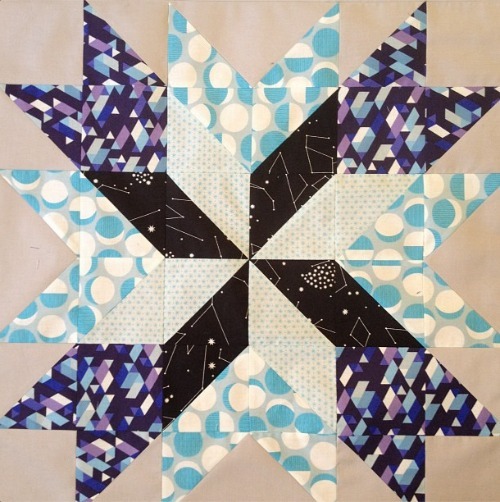 I knew that I wanted to make a quilt, and I knew that it just had to have some stars. Then the idea of paper pieceing arrows sort of just popped into my head out of nowhere and so Orion was born - named after the Orion constellation also known as The Hunter. I know that you can't tell from the picture but this baby is 57" square - the stars are, obviously, huge! The back features even more Constellations fabric as well as some Kona Ash (used in the front also) and my extra little arrow that I pieced while testing out the templates I drew up. 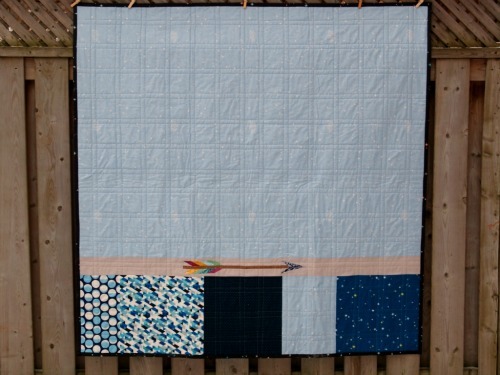 The test arrow is a bit scrappier than the ones on the front of the quilt, but still has at least two Lizzy House prints in it! 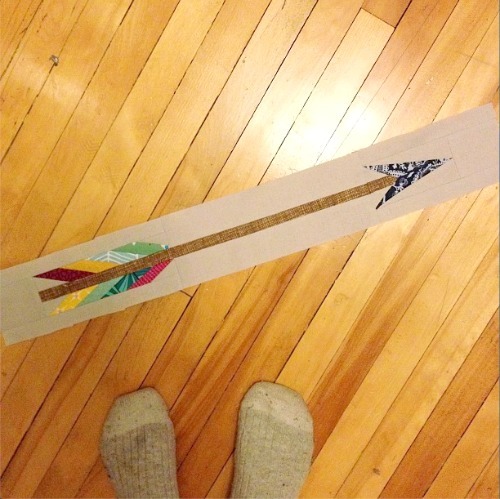 More arrow-love! I have to admit that I had a lot of fun drafting up the templates for these babies and I am so happy with the way they turned out! Action shot! Hehehe! It was so seriously windy while I was taking all of these pictures that (once again) the quilt was pulled off the fence and I had to chase it down. Fun though, even if a little cold. The pattern including step-by-step instructions, diagrams, and the paper piecing templates is now available as a PDF in both my Craftsy and Etsy shops (remember: if you purchase through the Craftsy shop it is an automatic download and you don't have to wait for me to email it to you) - woot! 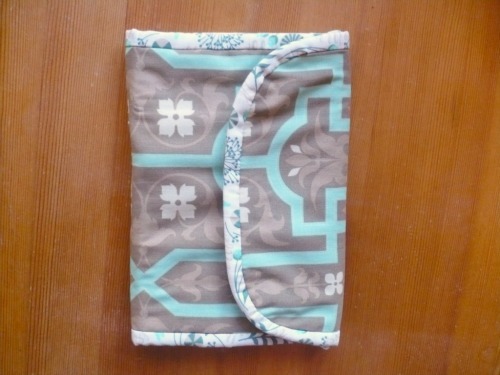 The pattern features instructions for two different sizes - the lap (pictured on the cover) and the double/queen (finishes at 84" square); there is also a couple of extra little ideas in the pattern for utilizing portions of the pattern in different ways. 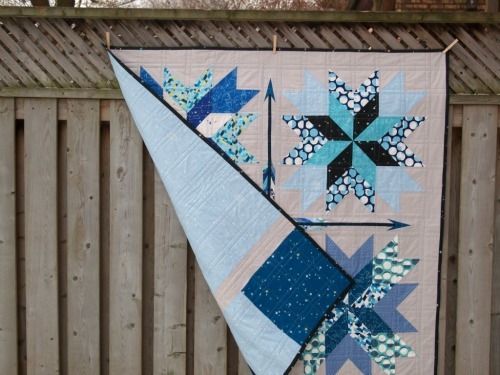 The pattern does assume that you understand the basics of paper piecing, but if not, there are a lot of really great tutorials (including video tutorials) on the net - that's how I learned myself. And now the two winners of a free copy of the pattern! 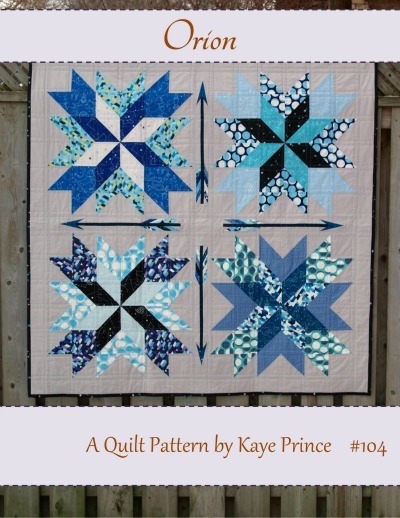 For guessing the correct pattern name first the winner is: Kasey of Stitch Bake Run and for just being an awesome follower of my blog the winner is: Needle and Nest (sorry, I don't have your real name). Please email me ladies and I will email you your copy of the pattern - I hope you enjoy!! Just another big thank you to Andover for being awesome - you guys totally rocked my world!! Well now, I'm finally getting around to sharing some of the things I made my mum for Christmas! I made most of the Hanukkah and Christmas presents this year, which was fun, but also a bit stressful and time consuming! 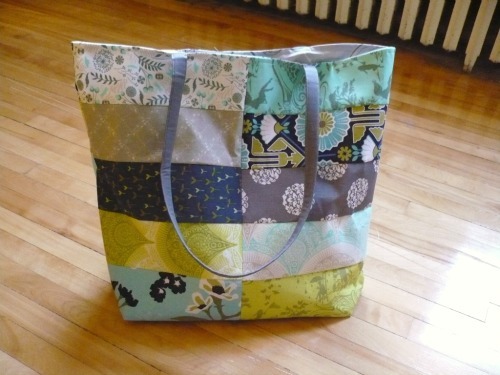 I started this Ship Shape Tote in Alexia's class at Sewing Summit - I love it! Originally I was going to go for a more neutral colour theme, but my mum likes colour so I decided to go a bit bolder. I included prints from Tula's Prince Charming, Joel Dewberry's Modern Meadow, Paula Prass' Woodland Delight, and a few other collections. The handles are Kona Medium Grey and the inside is a grey leaf print from Ikea. The pattern is well-written and came together really easily. 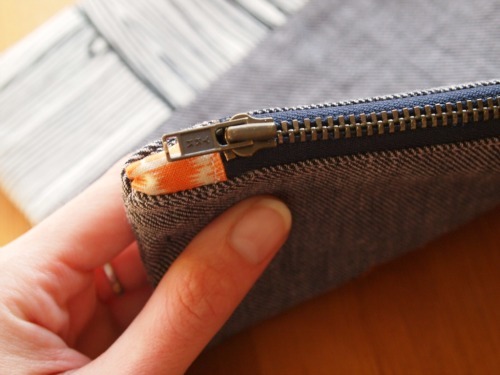 It is super roomy and I would recommend adding a pocket or two to the inside so that you won't lose smaller items in the bottom since it is so big. 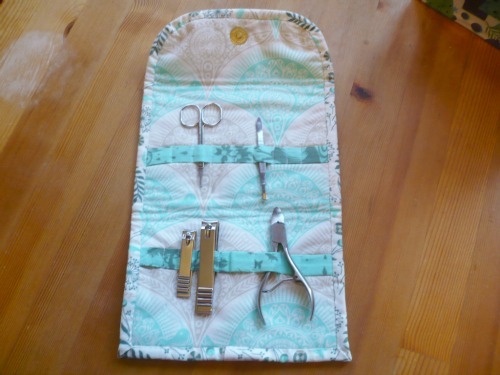 I also made her this manicure kit following Rashida's Nice and Neat Manicure Kit tutorial featured on the Art Gallery Fabrics blog. The outside is a print from Joel Dewberry's Deer Valley collection (I always seem to use a lot of Joel Dewberry when making things for my mum). And the inside and binding are all Tula (again! One thing that has always struck me about Free Spirit is how well they match collections together over a season or two... anyway...). I picked up a couple of manicure items and slipped them into their little slots, unfortunately I was having no luck finding one of the shorter nail files but hopefully my mum can find one - there is lots of space left over for her to add whatever she wants. This tutorial was really well written and I pretty much always love any pattern that Rashida comes up with! 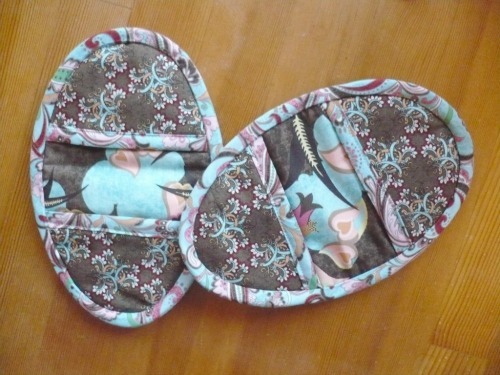 These little oven mitts were made using fabrics from the Blush collection by Basic Grey and they are lined with both quilt batting and Insul-Brite. These are a little bit bigger than your standard finger mitts because my mumma has big hands! She was pretty happy that I made them bigger and I hope she uses them a lot. 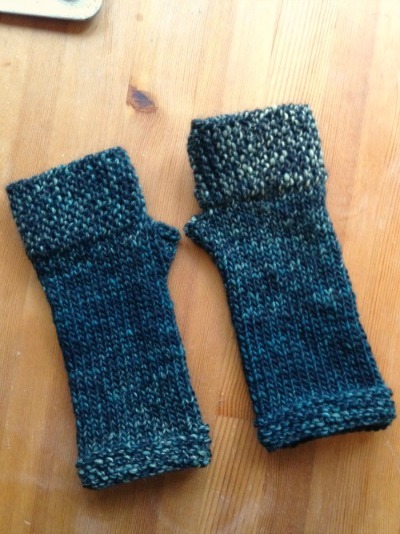 These are the Camp Out Fingerless Mitts (a free pattern on Ravelry) made using di.Ve Autunno - the yarn is so hard to photograph but is really pretty. It's a mix of green and black but the green variagates throughout from light to dark. Again, I made these bigger because of mum's big hands (went up to 6mm DPNs) and I added a garter cuff to keep them from rolling. Using the same yarn, I made Calorimetry to match (a free pattern from Knitty). 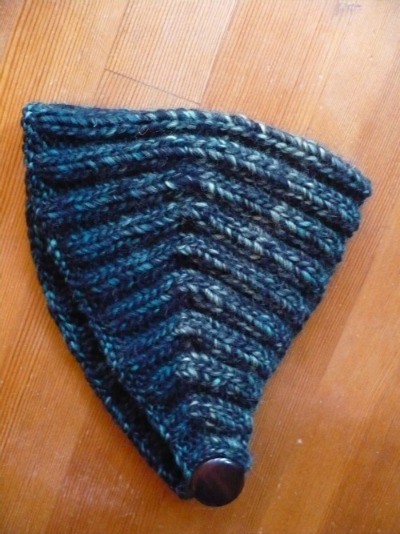 It is shaped using short rows and the construction is so cool! Check out the Knitty pattern to see it being worn - it's really neat! I thought my mum would like it because it's less likely to mess up her hair than a hat or standard headband, ha! 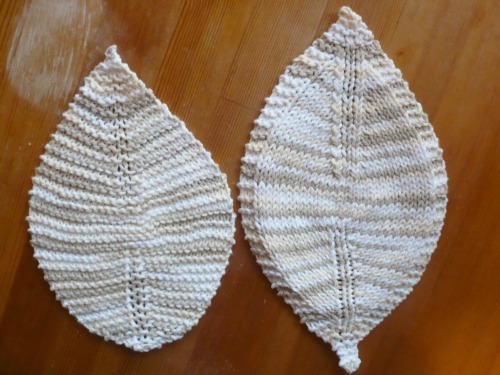 And last, but not least, I also knit her a set of leaf-shaped washcloths (again, a free pattern). My mum has been crocheting dishcloths for years but I thought she might appreciate someone else making her a set for a change - and they're shaped like leaves so I couldn't resist! These went into her stocking with a few other bits and bobs. Phew, just posting all of those brings back frantic memories of trying to get everything finished in time! 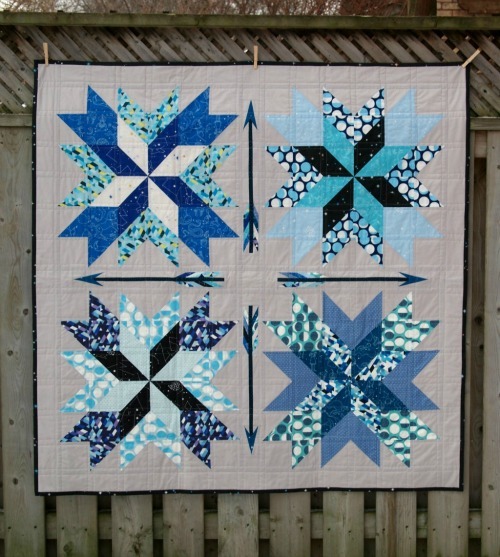 I'll be back on Thursday with the debut of my new quilt pattern, just have to put a few finishing touches on the write-up and it will be finished, hurray! Hey y'all! 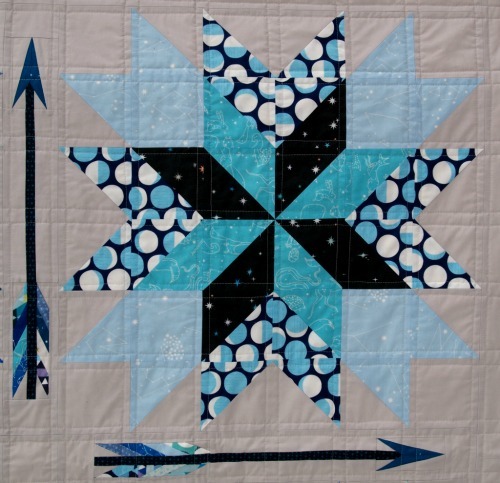 So I have a new quilt pattern coming out in a week and I thought it would be fun to play a little game. I'm going to show you three things associated with it and you have to try and guess the name that I've given to the new pattern. The first person to correctly identify what name I've given to the new pattern will win a free PDF copy of it when it is released next week. If you are a follower leave a second comment and I will randomly choose a second person to also receive a free copy of the pattern - woot! Since I'll be debuting the pattern on January 31st, I'll leave the contest open until then and announce the winners in the same post. If no one guesses the correct name I will pick another winner randomly! Hey y'all! How's everyone doing! So, as many of you know I attended Sewing Summit back in October; when I found out I was going I contacted my lovely editor at Stitch Craft Create and pitched her the idea of writing an article about the conference. She agreed and so for the entire conference I took pictures, jotted down ideas, made notes about classes, attendance and participants, and just generally got into the spirit by absorbing everything that was going on around me. I spent a hectic few days writing and editing my article and gathering my pictures and sent it off to SCC before I had even been home for a week. My article appears in the Winter 2013 issue of SCC which can be found on newsstands now! 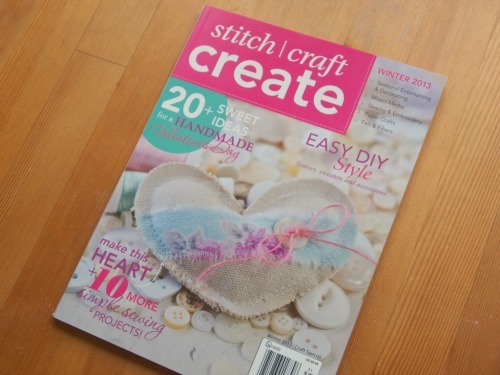 As always, this issue is filled with gorgeous crafty projects including an ear warmer by Kay Whitt that I think is seriously lovely and a chevron pillow from Corey embellished with buttons. There's also an article on Modern Inspirations from my friend Thomas. And here it is! Obviously I can't post the entire article online, and that opening bit there wasn't even written by me, but I did I take all of the pictures included in the article - there's a little bit of my vintage thread collection to add some colour! Unfortunately the lighting in the Sewing Summit venue is pretty yellow and terrible, so most of my pictures from the actual event weren't used, but at least it means that I took a ton of pictures (nearly 200) to remember it by. 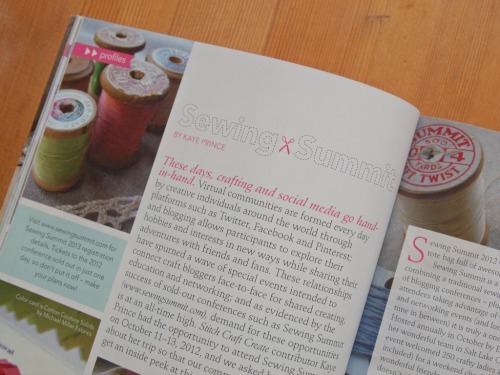 If you're interested in learning a bit more about Sewing Summit from a slightly different perspective, be sure to pick up this issue before it's gone! And thinking about Sewing Summit led me to remember that I never actually showed any of the projects I completed in my classes at the conference - man, I am running a little behind! One of the projects was made as a gift for my mum for Christmas so I'll show that when I share all of her presents, but here's the other one. Is a print from Denyse Schmidt's Hope Valley! I got a lot of compliments on this fabric combination from other attendees - many people said that they wouldn't have ever thought to put the two together. My corners aren't rounded as nicely as I would have liked, but it was a bit of a steep learning curve with the machines we had to use in classes. My machine is older and all manual, so using a computerized machine for the first time was a bit of a challenge! I still love it though and need to figure out a way to use it more often. 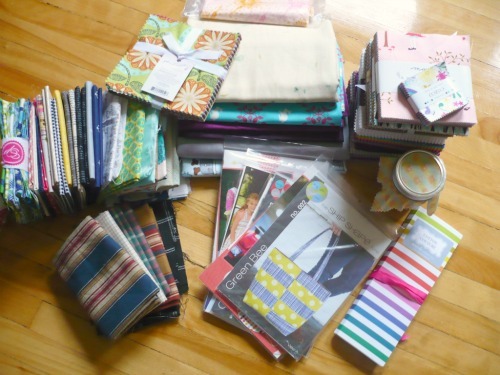 My Sewing Summit swag which I (apparently) also forgot to share with everyone - some bought, some won, some gifted, some samples - dang, that was a good haul! Holiday Catch-Up + the Giveaway Winner! Hey y'all! So I guess I took a bit of an inadvertent break there! With Hanukkah, Christmas, and our anniversary (and the fact that I made most of the presents for each and have been applying for jobs), the time just slipped away from me. But I'm back now, woot! I thought today that I would share some of the presents I made for Alex for the holidays. We'll start off with Hanukkah (since it did come first and all). But what could this be?! 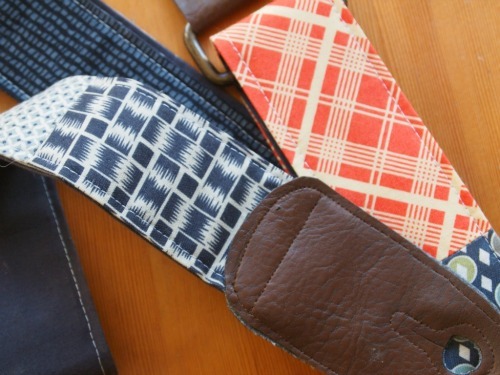 Why, it's a guitar strap, of course! Alex has been playing guitar for a number of years, and I thought it would be pretty fun to see if I could make him a new pretty strap to enjoy. I pulled out a bunch of Denyse Schmidt fabrics from both Hope Valley and Chicopee in colours that I thought he'd like and told then him to pull out any he didn't like particularly. 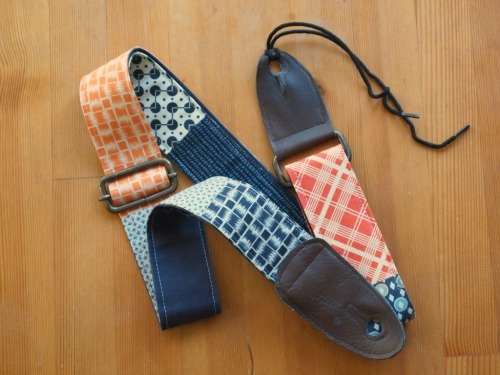 I used his old guitar strap as a basis for my measurements and pieced the patchwork part together (it's backed in Kona Medium Grey with a heavyweight interfacing in between); both the brass buckle and ring came from an old messenger bag of Alex's that I bought him almost four years ago but that broke about a year ago. 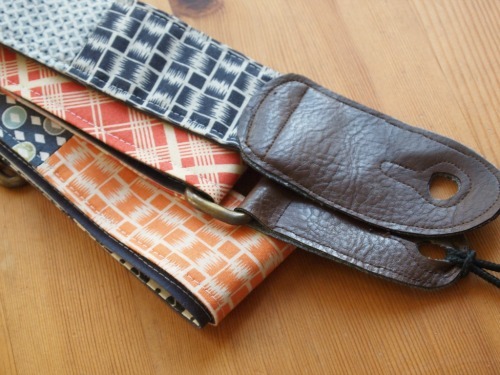 I cut the brown leather end bits from an old purse of mine and based them on the ones from his old guitar strap. It works perfectly! Now onto Christmas - these slippers took me almost four Harry Potter movies to knit and man did the chunky yarn and big needles make my hands hurt! 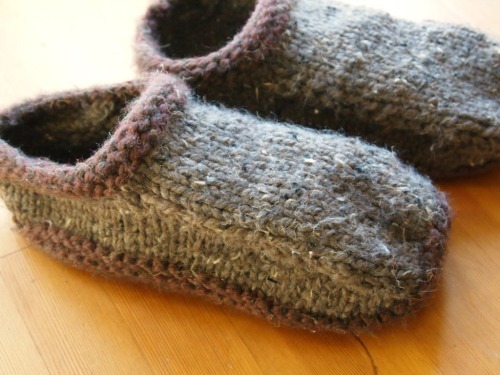 I used the Non-Felted Slippers pattern which can be found free on Ravelry and only made a couple of changes to make them bigger (the original pattern is about a ladies medium) - my pattern notes can be found on Ravelry here. 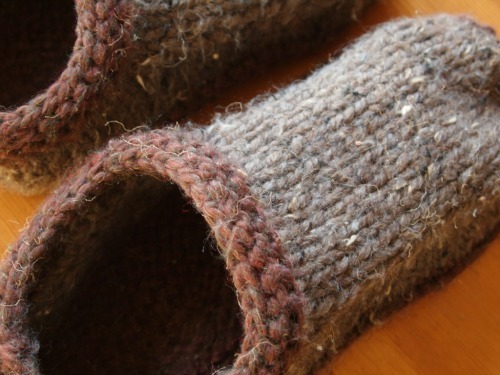 I really like these slippers because I think they have a more masculine feel than many other slipper patterns I've seen and they are super-chunky and cozy. 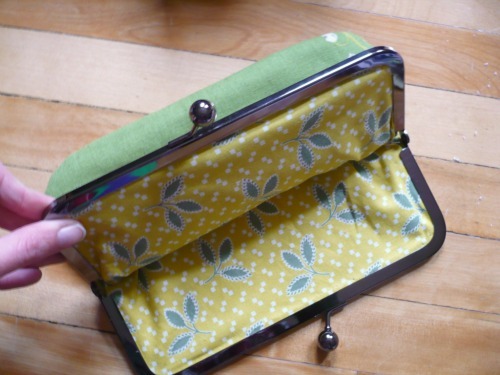 I also made him this zipper pouch! 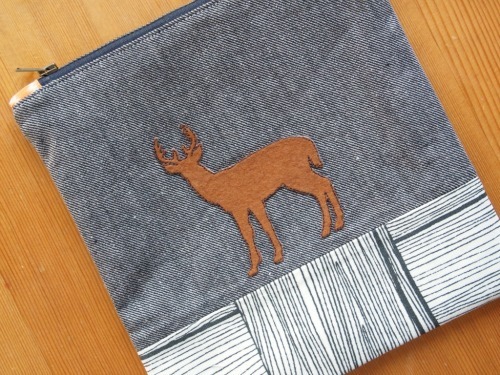 The white wood grain fabric is Ikea and the denim-y looking fabric is actually wool suiting in sort of a grey-blue; the deer is an iron-on patch that I bought ages ago with Alex in mind and this seemed like the perfect opportunity to finally use it! I'm starting to get the hang of this zipper thing (this was only my third I think), so this time I decided to be a little adventurous and try zipper tabs - seemed to come out alright I think! 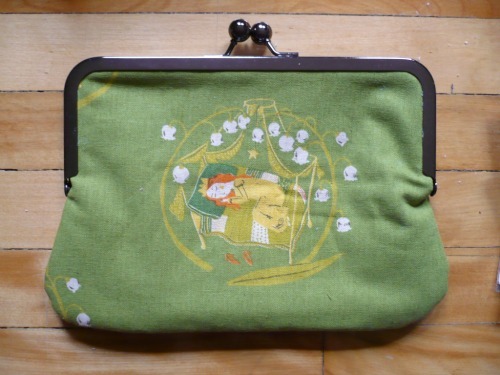 I also used a metal zipper because I thought it would give the pouch a little more ruggedness. 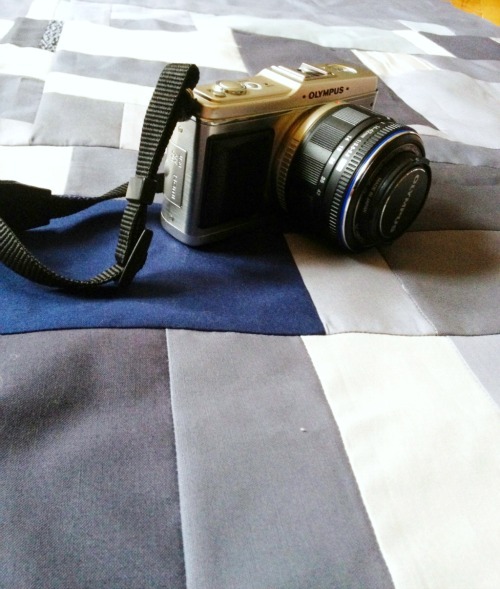 And these photos (except this one of course) have all been brought to you by this baby - my new DSLR! It was my anniversary gift from Alex and I love it; Alex's anniversary gift is sitting under it not quite done. I'm making Alex his own quilt but couldn't get it all completed prior to our anniversary since he works from home. I just wrapped up the top and gave it to him. 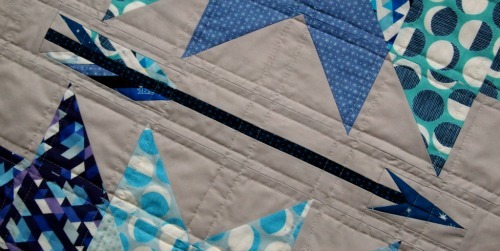 I'll show the whole thing when I get it all quilted and bound. 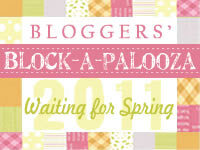 Now I bet you want to know who won my Blogger's Choice bundle from FQS, right? Congratulations Jenelle! Please get in contact with me via email with your address and Fat Quarter Shop will get your bundle sent out to you! Phew, alright, I'm done. 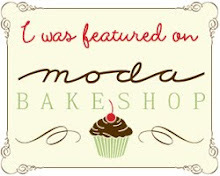 That was a long post but I'll be back soon with even more holiday gifts and even more crafty happenings around here!